People have long been predicting the 'arrival' of mobile as a force in media and advertising. There have been a range of false dawns but a number of signs are indicating that mobile is (finally) here. There are now 56,000 iPhone Apps (+ new rival App stores from Palm, Nokia and Blackberry), an increased propensity to use mobile for social networking (free Twitter SMS updates, 30m+ Facebook users through mobile etc), publishers optimising their sites for mobile (eg Telegraph, NYT etc) and expanding use of mobile technology like AR and QR codes. 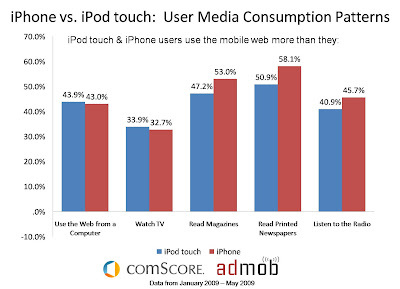 1) A study from AdMob and Comscore on 'the demographics and behavioral characteristics of iPhone and iPod touch users' shows that 58% of iPhone users now surf the mobile web more frequently than they read the print version of newspapers, listen to the radio (45.7%) or even watch TV (32.7%). AdMob found that Apple's iPhone is also having an impact on internet browsing from PCs, with 43 per cent of users accessing the web from their iPhone more regularly than from their computer. Report author Thomas Husson explains: "Apple is only the tip of the iceberg, as drivers are now in place for mass-market uptake of the mobile Internet in Europe. The expansion of Internet brands, smarter phones, and high-speed networks are enabling compelling user experiences that, coupled with all-you-can-eat data plans, are unleashing usage." 3) CCS Insight ran a survey of more than 1,000 adults between 16 and 35 years old aimed at gaining more insight into the mobile Internet habits of this age group. Paolo Pescatore, report author is quoted: "Forget music downloads and video – social networking is what people want." 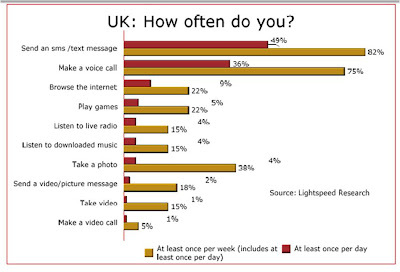 For the UK market, internet browsing was recorded as 9% daily usage and 22% weekly. There are also some interesting figures around video - 15% take video once a week and 5% of users making a video call once a week. The responses to the question about future functionality were interesting too - in all regions a satellite navigation system was the top choice, with 49% of French, 44% of German, 43% of British and 38% of American respondents choosing that option. Continued growth in mobile internet usage, particularly as the 'Smart Phone' sector increases whilst other handsets come with Smart Phone-esque features as standard. There will also be further growth in the App market as the Apple Store continues to grow and competitors like Nokia's Ovi store start to scale. Furthermore, some (like Thomas Husson) are arguing that location based services will be the next big thing in mobile - Thomas writes "If consumer product strategists manage to build a compelling user experience and reassure consumers about privacy and pricing issues, location as a service will become obsolete — and will instead become a core enabler of mobile activities." The Lightspeed Research above also points in this direction. However, whilst LBS (location based services) will continue to develop and consumers will continue to use mobile for social networking, my feeling is that mobile video is the big development area. All-you-can eat mobile data tariffs are allowing mobile users to use their phones to create, upload and watch video on the go. Services like Qik , Twiddeo and TwitVid are enabling mobile video to be easily shared whilst Facebook and YouTube are improving mobile upload functionality. Indeed, TechCrunch are reporting that YouTube have seen direct mobile uploads increase by 1700% in 6 months with the number of mobile uploads increasing by 400% in the 6 days after the launch of the iPhone 3GS. Couple this to consumer desire for mobile viewing opportunities (like the mobile iPlayer identified in the CCS Insight research above) and I think the pieces are in place to see mobile video really take off - fundamentally changing the mobile landscape as it does. While the article forms an interesting read and I agree with the fact that mobile is the next big thing, I felt it was very US centric story. The reason I say that is because while iPhones are the rave in the country, it is just barely present in the rest of the world. In fact, the emerging markets enjoy a higher level of mobile penetration compared to internet penetration due to bad fixed line infrastructure. This definitely supports the article, but all I am saying is that the reasons for success in the developed nations like the US and emerging markets like India is very different. It's written from a UK / European perspective rather than a US perspective, however it is centred around what iPhone has done / is doing to these markets and how it is changing the landscape. However, I haven't ignored other suppliers - I talk primarily about 'Smart Phones' rather than purely 'iPhones.' I also think a number of the general trends identified apply everywhere, though I agree, there are some major differences between each region / country. Nokia is arguably the dominant supplier in markets like India, the Philippines and Indonesia. However, Nokia continue to develop new handsets / handset capabilities and are also developing services like the Ovi store - these will also contribute to the changing mobile landscape. You may find latest AdMob mobile metrics research by country interesting too - clearly shows the differences between countries! Just for the record though, less than 50% of AdMob's traffic comes from the US, with emerging markets like Indonesia and India both accounting for more than 500 million page views a month.